This afternoon we launched the live report platform for the Big City Marathons. The first edition which it is aggregating is the NYC Marathon. 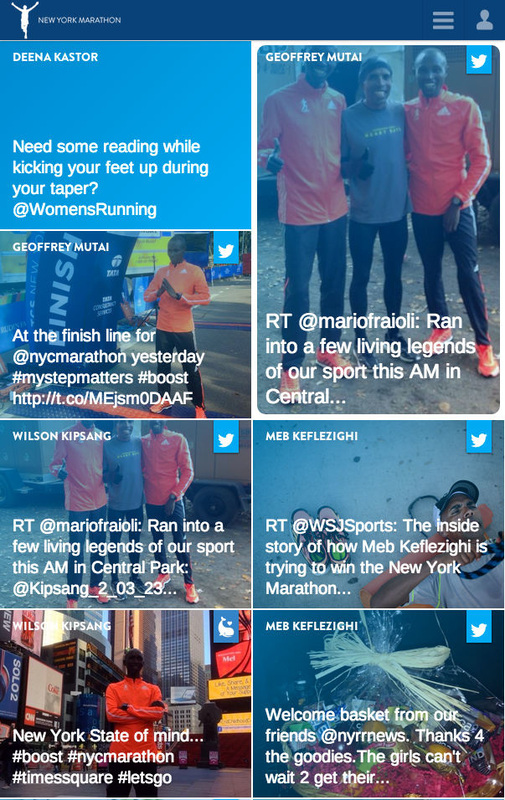 All Social Media postings and news surrounding the marathons is aggregated. For fans and lovers of running this is an easy way to follow the marathons. For runners and supporters it is an extra platform to share their running adventures and reach their friends. Why would we build a platform for marathons? We love running and we love New York City. Týrsday founders Gijsbregt and Mathys visit New York a lot. Gijsbregt has run the New York City Marathon twice (2003 and 2011) and has run 16 marathons in total. Týrsday employee Tom Hak will run the NYC Marathon this Sunday. As will many of our friends. Our clients are running as well: Wilson Kipsang, the only person in the world to finish five marathons below 2.05 is aiming for the course record. We have used our state of the art social sharing technology to build this responsive platform. Realtime all social updates on the New York City Marathon are being aggregated and show on our #NYCM wall. The wall will work on all devices (even on Jumbotrons). You can join us by sharing your adventures using the event hashtags (such as #nycm and #nycmarathon). If you wish to be in our specials stream (to promote your charity) use Mobypicture to share your content (and use the hashtag). If you have any questions, let us know at our contact page.